They began in Ottawa, where Sophie took a page out of Eugenie’s style book and sported a Peter Pilotto print dress. And just as we learned when Eugenie did it, this is not going to suit the tastes of everyone – nothing with this much statement ever does – but I still applaud her for the youthful spirit. Of more general love I’m sure will be this fantastic red dress worn with a wedge that is as close to delicate as wedges come. Next up was Nunavut, and this beige coat/dress/thing, and then Iqaluit, where she also wore beige, and then a more of a va va voom turn just to counteract the blergh in sleek black at the Toronto International Film Festival. I’m not usually one for gimmicky handbags, but I’d take that fan off her hands right quick. The extra shiny stockings are the only thing bringing me down here. Quite a fish out of water statement at something like TIFF. 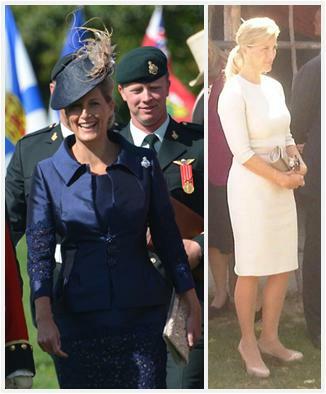 On day 4 we got a royal repeat of her Jubilee outfit – and a regimental brooch, as she was presenting new colors to the Lincoln and Welland Regiment – but then she was all colored out, I guess, because it was back to beige the next day for more Ontario engagements. This one reminds me very much of Kate’s beige Malene Birger dress from one of her Canada stops last year; serviceable and princess-y, but nothing to write home about. Sophie and Edward's trip ends today. What's your favorite outfit from Sophie on this trip to the Canadian wonderland?